We know from the information provided in the basic compendium that the Space Ark / Zoo of the mother and father crash landed in northern Rakbar after systems failure during the use of the experimental hyperdrive, so we know that the mother and father and all the janah occupied this one single shard of the broken planet without the means to visit any other shards and for the most part, without any knowledge of the existence of the other shards. What if there was another shard or shards where the janah somehow proliferated anyway? Perhaps the ship broke up in the landing like General Grievous' battle cruiser in Star Wars-Episode III - Revenge of the Sith and some janah DID land on another shard and miraculously survive. 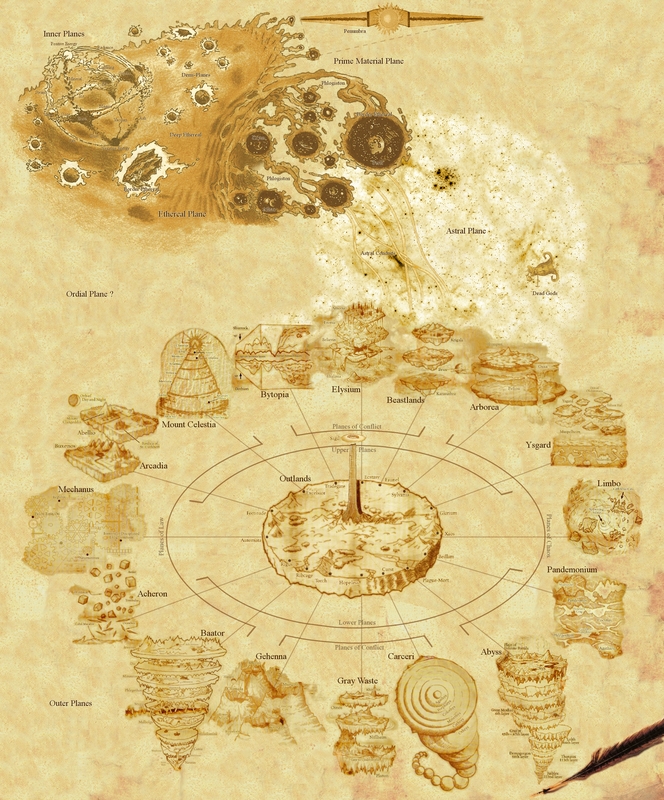 In the distant, pre-historic past when janah and Chün co-existed before the decision to separate, some chün, being fully aware of the existence of all the other shards, took some of the janah to them, either as slaves, or food-livestock, or colonists, or even some unguessable Chünish reason alien to our understanding! Maybe you could have a shard where the janah's culture arose WITHOUT the influence and benefits of the presence of the mother and father and the deva. A place where other gods not of the deva we know arose, or even an understanding of Shündé like we now see just beginning in our characters has long been established. Plus, imagine the ENTIRELY different culture they might have, even more animistic and alien to us American Roleplayers that the Middle and Far Eastern cultural paradigms of the Shard we know and play on. Maybe something more like we see in the book "The Weigher" (Author(s): Eric Vinicoff, Marcia Martin; ISBN: 0671721445/0-671-72144-5 (USA edition)) A place where the retention of the practice of predator animals eating prey animals was allowed to progress in it's natural course to this current day. Or even stranger, imagine that they adopted the Chün culture, the different magic and 'technology' (such as it is) of the insect people as their own! Only a handful of Jenu survived the crash or came over with the Chün or whatever, such that only five or so different jenu occupy the whole shard, not even knowing that there ARE any other types of janah! That may seem unlikely at first, but it would really be just like Earth there with it's five races of mankind, Hispanic, Asian, White, Black and Middle Eastern. And imagine that each Jenu's culture that arose over their ten-thousand year history was as different as the various Earth -race cultures. So you might have for example, a nation of lions, a nation of buffalo, a nation of sparrows, a nation of monkeys and a nation of Rattlesnakes. And that's it! No other jenu on the whole shard and multitudes of those five jenu forming entire civilizations, derived entirely from the instinct and influence of their own species. You might, for example, see such developements as a monkey culture that is entirely arboreal, and so is the Sparrow civilization. Whereas the Lion culture are raiding bands of nomads, like vikings or the Mongol Hordesor even something akin to the Native American way of living off the land and following food herds. Perhaps the buffalo culture is a city building civilization, good at defense. And finally the rattlesnake empire is subterranean, like Morlocs but cooler. Okay so those were just examples of the stuff that came immediately to my mind. Now here's were we borrow a stroke of genius from Massively Multiplayer Online Games and the savvy RPG company, Wizards of the Coast, the inheritors of the mighty TSR game company we all grew up with. MMORPG's have a cool draw in that people feel as though they contribute and help shape the world. Some players proudly talk about how their blacksmith shop in Ultima Online was actually known throughout the real earth world by customers whos character came there for services and whos' players were from countries as far flung as Japan and Germany and South Africa. They enjoyed the personal satisfaction of doing something that was enjoyed and partaken of by people all over the world. Now, look at the Eberron project that Wizards of the Coast did just a few years ago, they asked the world-wide community of D&D players to submit suggestions of neat ideas to help build their game world to replace GreyHawk and the Forgotten Realms. The response from the gaming community was tremendous! People really liked the idea of being able to proudly say, "I made this!" when referring to some aspect of the new Eberron game world they had developed. We can take advantage of the same community building concept and it's allready built into the game world! I mean look at the cover of the world guide! There must be ten shards at least, and all the world we've developed only occupies ONE SINGLE SHARD! Friends, this is the potential for somethign that could be awesomely popular. A chance to create a gaming community that could well outlast the lives of the original developers. Plus the dardunah company could draw from literally hundreds or thousands of creative minds to cull the best ideas, the finest concepts and make the greatest possible game world ever yet seen by Role Playing Gamers! And, you don't even have to hire and pay them a ton of money! If you even offered a modest cash prize for winning entries, say, 1000 dollars and a free copy of every book for the game system ever produced for a lifetime, I'm SURE people would send in entries by the drove. So anyway, that was my idea in the first place. Then I remembered Ezra and I having talked about a Dardünah Future sourcebook for the game and I dug up my old notes for that. I'll make that a second post though. If the first ship accidentally pulled another ship through with the experimental hyperdrive, then somewhere their may be a shard where a fragment of humanity exists. You know what this idea makes me think of? Also if you ever have an awesome idea for your game that doesn't fit into the game world, think Planescape!/Rifts! Parallel Dimensions, Different types of Hells/Heavens belonging to different deities, Magically generated worlds inside artifacts, etc etc! Maybe each of the shards is one of the planes of heaven or hell that the Janah believe in. Hmm, heaven hell being a physical place somewhere on the same planet sounds pretty crazy, but I think personally I'd go for hell being a parallel dimension, or down in the depths of the planet. It just allows the other shards to be room for even more versatile and new environments. I gotta admit,...that does sound like it would be a totally cool visual...! That it does. And just in case Aaron reads this, Remember, you'll never get that dolphin image out of your head! Next time I offer to show you a picture, you guys might just want to turn me down on that offer! Lol. Every Day My Heart Goes With It. I'm looking through the copy of the book I've got and I can't seem to find the sections of history that you're referring to, or even any mention of these Chun fellows - it is disturbing, but perhaps I'm just having a brainfart. I don't really know either, but from what I have gathered the Chün are supposedly the insectoid "natives" of Dárdünah that lived there before the Janah arrived. The post was edited 1 time, last by Sherbie ( Aug 29th 2010, 6:56am ). But where is this information? I've always been unsatisfied with the detail in the Basic Compendium, but maybe I have somehow missed something...? A secret section that is only there if you BELIEVE? He's also talking about stuff that were elements of my own personal games (such as the original insectoid native Chün race) that may never see the light of day as approved and published material... Just another example of how individual GMs should feel free to have their own stuff they add to the fiction of their campaigns, especially if it makes their own games cool and fun! Aaaah, that makes sense then. I think the Chün fit very well into the whole scenario and could very well be added in with the World Guide, if just as a tiny footnote. As a civilization that supposedly has been erradicated many many centuries ago,but maybe left behind some tiny specks of their knowledge and glory, maybe even very well hidden ancestors (or living on other Shards), they could give Gamemasters a whole lot of to toy with! Like, a GM could reason that Demons were actually just Chün gods that have been defeated and locked away by the Devah? Controversial! Whole lot of material there! Somewhere out there is a shard were a group of humans survived but several Jennu simian types also survived. The humans are at war and slowly losing their territory and lives against these Jennu. We will choose to call this Shard "the planet of the apes"
This is an idea I myself have kicked around quite a bit myself and I am glad to see I am not the only one. The rules say that there are no humans on the planet due the incident which caused the essence of the Great MOTHER AND FATHER to reshape the animals within their care into the denizens of the world....they were the only humans on the world.... but the rules also state that you can create any animal which lives or has lived on our natural world, and humans are animals , are we not? specifically a type of primate so it stands to reason that a hairless monkey or an ape with out the prehensile feet would be a good starting point to create this new and species of Vajrah. This type of human could be more like the neanderthals or earlier version of humans prior to the modern adaptations. If there were some alternate fiction which could support the arrival of this new infusion of humans. Further more , with in the scope of SHARD there is no record of what a human actually is..... would it not just be considered another strange type of animal person? I guess we will all just have to wait and see what Scott says regarding this idea and proceed from there! Keeping in mind that what you propose may only work for a short run campaign idea and not be something able to be published in any of the game material gives you the freedom to explore this idea as well as any others with regards to alternate lifeforms so long as they can be adapted to fit the rules for new types of character creation, Janah and Creatures at the end of the Players Handbook. The post was edited 2 times, last by griffin ( Mar 15th 2018, 9:05pm ).